with carrot cake and cream cheese the children we'll feed. when they see the cotton candy topper so blue and so light! This was such an adorable idea I just had to find out more! We modified the recipe a bit and had the children and parents join in on the fun! Here is what you'll need for to create your Dr. Seuss Thing One and Thing Two cakes. 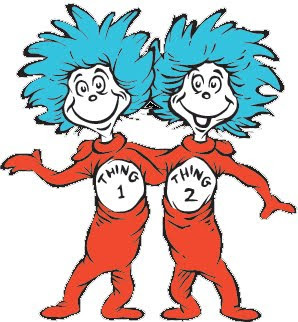 Make no mistake-it's Thing One and Thing Two Cake! The Process: After the children have helped prepare and bake the carrot cupcakes allow them to completely cool. Us a spoon and have children douse the top with a generous helping of warmed cream cheese. Then tear off a small amount of blue cotton candy and allow the children to arrange the 'Things' hair. I allow the children to write on the labels with black markers or crayons. Be sure to take pictures, this is one for the kids photo albums! Your kids must've loved these! Truly awesome. We had a Dr. Seuss celebration at our school. The middle schoolers participated by making book covers. They went nuts, actually. The parents are really the ones keeping this going. When there is this much enthusiasm of school we tend to run with it.